Co-Dependency – Kathy J. Marshack, Ph.D.
Codependence, the act of sacrificing oneself for the sake of another’s obsession or compulsion. Codependence is a confusing term, unless you are familiar with alcoholism. Yet, you don’t have to be an alcoholic, or live in an alcoholic family to be codependent. Codependence is an attitude, a style of living. People become codependent when they consistently allow their own needs and rights to become secondary to another’s needs and rights. For example, a wife is codependent to her alcoholic husband, when she calls his employer to make excuses for why he is not at work. Or a child may be codependent to her chemically dependent mother, when she tells her friends that mother just has the “flu.” Or a boyfriend may be codependent to his girlfriend when she’s always out of money and he pays her rent, just to help out. Does it seem you can’t do enough… ? There are other symptoms of codependence too. Are you tired and depressed all the time? Does it seem you can’t do enough to please your partner, father, girlfriend? Are you the only one who cares if things get better? Are you getting more and more headaches, backaches, stomach aches? Are you sacrificing your good reputation to help someone who doesn’t give back? Feel unappreciated? Are you relying on food, shopping, alcohol or other drugs to give you a lift? All of these symptoms are examples of codependence in actions. And they can be devastating for you personally, as well as your relationships. Many codependent people are loving, thoughtful and generous. Yet, their generosity is misunderstood by people who are addicted. This misunderstanding can lead to a relationship that is strangled by depression, mistrust, chemical addiction, physical abuse and so on. To break this devastating cycle, it is important for the codependent to recognize that you count just as much as the person you are protecting. Why are your rights as a person or your health less important than theirs? Secondly, by breaking the cycle of codependence, you are giving back, to the addict, responsibility for their behavior. The first step toward your recover and theirs, is accepting responsibility for your own behavior and your own live. After all, how can they get better if you do it for them? Breaking codependency is extremely difficult to do without help, especially regular support from others. In addition to psychotherapy, or marital therapy, you may want to call self-help groups, such as Al-Anon or Codependents Anonymous, both listed in your local directory. Dr. Marshack’s book on empathy dysfunctions (EmD) can help too because codependence is directly related to a faulty empathy system in at least one of the partners or family members. 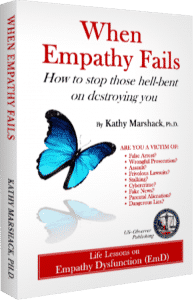 When Empathy Fails: How to stop those hell-bent on destroying you is now available now at Amazon.com.